There are a wide variety of types of hospital bed available to suit an equally wide variety of purposes within a hospital. Different types of bed are required for different situations, different patient conditions and different treatments. All are essential but it is important to select the correct type of bed to match the purpose for which it is required. The gatch bed is one of the very tradition types of hospital beds which do not rely on the use of electricity. They are thus widespread amongst nursing homes and hospitals which are in remote areas or financially challenged. Gatch hospital beds are operated using a series of three cranks located at the foot of the bed. The first crank raises and lowers the entire bed, the second crank raises and lowers the head of the bed and the third crank raises and lowers the foot of the bed. Although these beds do not take advantage of the latest technology, they are very functional and serve their purpose to a good standard. 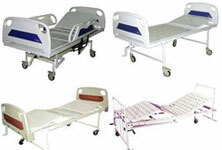 The electric bed is widespread amongst the majority of modern hospitals in developed countries. The main feature of the bed is that the adjustment of position is obtained using a series of buttons which are connected to an electric motor. The key advantage to electric types of hospital beds is that the patient can adjust the position of the bed themselves without the need for assistance from medical staff. Furthermore, such beds are much more versatile, offering a greater range of positions and adjustments that can be made to the bed. Stretchers are very functional types of hospital beds which are designed for maximum mobility while ensuring that the patient is relatively comfortable. These beds are used extensively for transferring patients from the site of an emergency to an ambulance or helicopter to the hospital itself. Low beds are used for patients who are liable to fall from the bed and cause themselves injury. These beds are much lower than the traditional hospital bed and are used in special cases. Low air loss beds feature special cushions and a mattress which contains air sacs which air is blown into. Such beds are specifically designed for patients who have experienced burns or skin grafts as the bed keeps them cool and dry while reducing the pressure on the skin. Furthermore, these beds are ideal for patients who are prone to ulcers, circulatory or skin conditions. Other types of hospital beds include the circo-electric bed and the clinitron bed. The circo-electric bed enables the bed to be rotated within circular bars. Such beds are used for patients who are in traction and with severe skin conditions, burns or spinal injuries who cannot bed moved but the bed must be turned every couple of hours. The clinitron bed is similar to the low air loss bed in that it is suitable for patients with burns, skin conditions and ulcers as it is filled with a low pressure sand-like material.